Lotus Temple is one of the most picturesque temples of India. Lotus Temple stands seventh in the international chain of Bahai House of Worship. 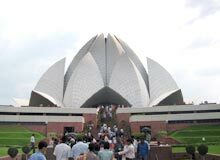 Lotus Bahai Temple is considered as the Mother Temple of the Indian Continent. The splendid architecture of the temple has been accredited with several architectural awards. Fariborz Sahba is recognized as the architect of this beautiful structure, who is an Iranian. The construction of this temple took around 6 years, till it was opened for the public in 1986. The structure of this temple is derived from the Lotus, the national flower of India. The Lotus has been a significant part of the Hindu religion too. A glimpse of Lotus, gives the idea of peace and serenity. The marvelous structure of the temple comprises 27 self-supporting marble clad "petals" that are arranged in groups of three to form nine faces. The temple is shaped in the form of a half opened Lotus Flower and the main structure encircled by nine ponds. There are nine doors that lead to the central hall. In fact, number nine is considered sacred in Bahai faith, which depicts all the major nine faiths of the World. The central hall suggests that all nine religions are dedicated to the sole God, the almighty. This central hall can manage 2500 people at a time. The main structure stands on a raised platform and covers around 26 acres of land. Due to its magnificent structure, Lotus Temple is also known as the 'Taj of Modern India'. It is a beautiful example of landscaping and modern architecture. The complex designing of this temple took around 10 years of labor. The grand structure has been the result of the western engineering design together with the Indian means of construction. Following the Bahai faith, Lotus Temple is open to people of all religions. It is a perfect place to practice meditation and attain peace of mind. The Temple doesn't observe any kind of sermons or rituals. The visitors are required to maintain silence inside the hall. 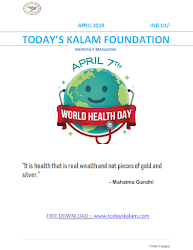 Bahai faith believes in religion free independent world that is divine in its origin, broad in its view, scientific in its technique, kind in its philosophy and dynamic in its nature. The temple complex has lush green gardens that leave a soothing impact on the spectator. This temple attracts people from all religions, castes and faiths to its campus. Lotus Temple is one of the most visited sites of the World. Tourists from abroad, come specially to visit this magnificent lotus shaped temple that leaves the onlooker in sheer astonishment.